Energy is not an everyday commodity, it is highly political. The 70% oil-price fall since mid-2014 therefore raises a host of political questions. 1. Oil is not a scarce resource any more. The geopolitical battle is no longer over access to resources but about global market share. In particular, Saudi Arabia seems intent on flooding global markets to push out higher-cost producers, especially in the US. But the oil glut could also have political reasons, such as undermining Russia. A more recent reason might be to prevent its regional rival Iran from re-entering the oil market, now that sanctions have been lifted. Iran, meanwhile, has little interest in cooperating with the Saudis on oil. That means that OPEC looks unlikely to be revived. 2. There is no longer a clear-cut front of oil producers vs consumers. Today, most of the big players are both. One-third of Saudi production is consumed at home. In 2014, the US overtook Russia as the world’s biggest energy (oil and gas) producer. This also makes coordinated action more difficult. 3. Climate policies are introducing new uncertainties on both the supply and demand side. If countries are serious about reaching a climate change target of 2 degrees Celsius (or even 1.5 degrees, as agreed in Paris), they simply cannot burn all the oil and gas that is still in the ground. Climate targets could leave a lot of energy resources as ‘stranded assets’. From the producers’ point of view, this means that it is no longer a smart strategy to leave oil in the ground on the assumption that a barrel pumped tomorrow will be worth more than a barrel pumped today. This might be one reason why not only Saudi Arabia, but also Russia is now producing at full capacity. 4. Saudi Arabia is no longer the swing producer in the global oil market. It keeps producing at full tilt even though the oil price has collapsed. In the past, Saudi Arabia’s balancing role meant that both low-cost and high-cost producers would supply the market at an elevated price that guaranteed an income stream for all producers. No longer. 5. With lower incomes, governments in oil producing countries can no longer lavish subsidies and other perks on their local populations. This might lead to domestic instability and repression– although it might also drive reforms in some producing countries desperate to shore up strained budgets and diversify away from oil. The countries that appear most immediately vulnerable to internal instability are Venezuela, Ecuador, Nigeria, Brazil and the Central Asian producers like Azerbaijan. Some people also worry about Saudi Arabia, which relies on oil for 70-80% of its budget revenue. But the country still has over $600 billion in cash reserves and among the lowest production costs in the world. Like Russia, Saudi Arabia has tightened its grip on domestic politics as the oil price has fallen and its foreign policy has become more assertive. It has also shown signs of accelerating reforms at home. 6. Technology is becoming more important. The boom in the US shale industry has been driven by innovations in drilling technologies. If, as many claim, the US is the new swing producer, the key role of technology makes it less predictable than Saudi Arabia, where decisions on production levels were centralized and political. Most energy analysts were surprised, for example, by how much the US shale industry has been able to cut costs rather than production. If the US industry manages to maintain production at lower prices, America will be heading towards self-sufficiency in oil and gas. Its interest in guaranteeing stability in the Middle East might wane accordingly. This, in turn, might exacerbate the geopolitical rivalries between Saudi Arabia and Iran and other players in the region. 7. At the moment, the oil market is so nervous that geopolitical tensions lead to lower prices. Usually it is the opposite. This dynamic (together with the QE-induced search for yield) mean that markets may not be pricing political risk correctly, and many businesses are not paying enough attention to it. 8. 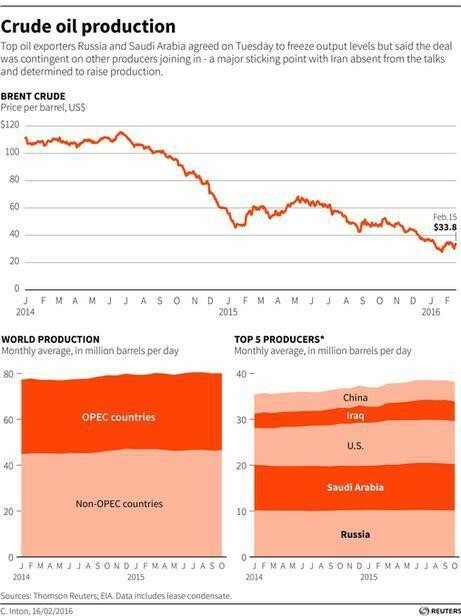 Since the big producers are pumping so much oil, they have less spare capacity. Saudi Arabia’s spare capacity, for instance, has roughly halved since 2009. This could mean that any disruption – think of an escalation of Saudi-Iranian tensions, for example – could lead to a (temporary) price shock. The views expressed in this blog are the author’s own and do not represent those of any company or institution.